TORONTO, Feb. 13, 2019 /CNW/ - First Cobalt Corp. (TSX-V: FCC; ASX: FCC; OTCQX: FTSSF) (the "Company") is pleased to report drill results from its Iron Creek Cobalt Project in Idaho, USA, that continue to extend the strike and width of the mineralized zones while also identifying more copper-rich areas to the west of the deposit. "In 2018, electric vehicle sales in America were up 81%. Worldwide, more than 2 million EVs were sold, still representing just 2% of the global market. This upward trend is expected to continue to gain momentum as many of the larger automotive companies prepare to rollout new EV models over the next eighteen months. "The Iron Creek deposit in Idaho, USA is one of a few primary cobalt deposits in the world and it also derives substantial value from copper mineralization. Today's results support our view that copper-rich areas provide options for mine planning. There are 18 drill holes pending which will be included in an updated mineral resource estimate that is expected at the end of March. We anticipate a notable enhancement over the maiden resource estimate we released in September with still further upside, as the deposit remains open in all directions." The four holes reported today were drilled beyond the western extent of the resource (Figure 1). Results from these holes have expanded mineralization an additional 120 metres in the Waite Zone and 60 metres in the No Name Zone. 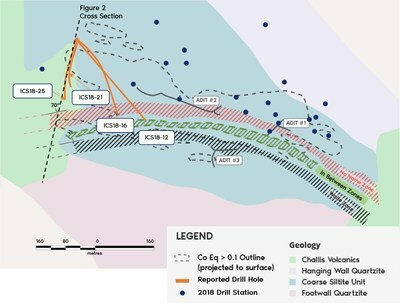 Whereas the previous resource estimate reported mineralization 150 metres below surface, the two westernmost holes released today trace mineralization to over 300 metres below surface, showing mineralization is open down-dip and along the western strike extent. 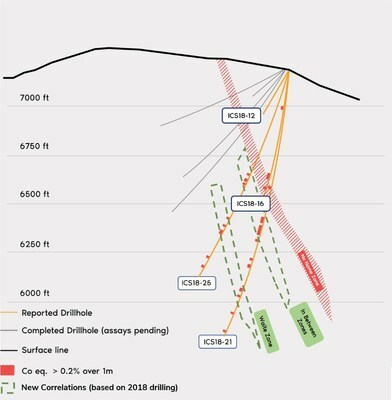 Together, extensions along strike and at depth continue to suggest further tonnage potential well beyond the boundaries of the maiden resource estimate. The Company continues to identify rich intervals of cobalt-copper mineralization between the No Name and Waite Zones. Iron Creek now has a continuous horizon of mineralization between the two zones along a strike length of approximately 800 metres (Figure 1). This results in better continuity of mineralization within a broader envelope that extends between 30 and 60 metres across the three horizons. The Iron Creek deposit is generally known to be more cobalt-rich to the east and more copper-rich to the west. Higher grade copper and cobalt zones within broader zones of mineralization provide optionality for mine planning. The drill results reported today are from a second phase of drilling that was conducted during 2018. A fan of holes drilled southward from the same surface station tested the strike extent of mineralization to the west of the current resource area. Cobalt grades were similar to nearby drill holes within the Inferred resource estimate, such as 6.6m of 0.25% Co including 1.4m of 0.59% Co in ICS18-16. Results indicate that the western portion of the No Name Zone is particularly copper-rich, having intercepted broad widths of copper mineralization including 2.22% Cu over 13.4m in ICS18-12. Results from the other two holes in this fan, ICS18-21 and ICS18-25, show mineralization extends to the west along the No Name and Waite Zones by 60m and 120m respectively. These two holes also contain intersections to approximately 300m below surface, which is a substantial increase to the known dip extent of the deposit (Figure 2). Similar to holes ISC18-12 and ISC18-16, broad widths of high grade copper were encountered along the No Name Zone including 2.92% Cu over 3.9m in ICS18-21. The Waite Zone continues to the west with grades consistent with the Inferred resource estimate including 0.27% Co over 1.9m within 0.15% Co over 5.3m as noted in ICS18-21. Similarly, copper rich portions also occur including 2.88% Cu and 0.12% Co over 4.0m in ICS18-25. Relatively rich intervals of cobalt-copper mineralization also persist between the two known zones, including 0.22% Co and 3.90% Cu over 1.9m including 0.47% Co and 10.37% Cu over 0.5m in ICS18-21, correlating to other drill holes further east. A continuous horizon of mineralization between the two zones has now been traced along a comparable strike length of approximately 800m. Higher grade copper mineralization west of Adit#2 was previously intersected in 2017 and 2018 drill holes. Today's results are consistent with the previous copper grades and the continuity of mineralization is now seen in several holes along strike and down-dip. Assay results from three additional holes from this surface station are pending and may reflect extension of mineralization to surface. True thickness estimated from 3D geological model also considering drill holes on strike. Cobalt equivalent is calculated as %CoEq = %Co + (%Cu/10) based on US$30/lb Co and US$3/lb Cu. No metallurgical recoveries were applied to either metal as it is expected that the metallurgical recoveries will be similar for both metals. Flotation tests support the Company's opinion that both cobalt and copper are of sufficient grade to be recovered. First Cobalt announced on September 26, 2018 an Inferred Resource estimate at Iron Creek of 26.9 million tonnes grading 0.11% cobalt equivalent (0.08% Co and 0.30% Cu containing 46.2 million pounds of cobalt and 176.2 million pounds of copper) under a base case scenario pit constrained and deeper mineral resource. An alternative underground-only scenario results in 4.4 million tonnes grading 0.23% Co and 0.68% Cu (0.30% CoEq) using a cutoff underground grade of 0.18% CoEq and containing 22.3 million pounds of cobalt and 66.7 million pounds of copper. The Inferred resource is based on drilling over a strike length of approximately 500 metres and a dip extent of over 150 metres. Preliminary metallurgical testing concludes that simple flotation methods are applicable, yielding recoveries of 96% for cobalt and 95% for copper in rougher floatation. Historic underground development includes 600 metres of drifting in three adits and an all-weather road connecting the project to a state highway. First Cobalt has implemented a quality control program to comply with industry best practices for sampling, chain of custody and analyses. Blanks, duplicates and standards are inserted at the core processing site as part of the QA/QC program. Samples are prepared and analyzed by American Assay Laboratories (AAL) in Sparks, Nevada. Over 15% of the samples analyzed are control samples consisting of checks, blanks, and duplicates inserted by the Company; in addition to the control samples inserted by the lab. Drill core samples are dried, weighed crushed to 85 % passing -6 mesh, roll crushed to 85% passing -10 mesh, split 250 gram pulps, then pulverized in a closed bowl ring pulverizer to 95% passing -150 mesh, then analyzed by a 5 acid digestion for ICP analysis. All samples have passed QA/QC protocols. Dr. Frank Santaguida, P.Geo., is the Qualified Person as defined by National Instrument 43-101 who has reviewed and approved the contents of this news release. Dr. Santaguida is also a Competent Person (as defined in the JORC Code, 2012 edition) who is a practicing member of the Association of Professional Geologists of Ontario (being a 'Recognised Professional Organisation' for the purposes of the ASX Listing Rules). Dr. Santaguida is employed on a full-time basis as Vice President, Exploration for First Cobalt. He has sufficient experience that is relevant to the activity being undertaken to qualify as a Competent Person as defined in the JORC Code.